Filipino cuisine is on the rise for recognition in the global marketplace. In this article, we will walk you through street food in the Philippines that you should not miss when you’re traveling there. For this article, we will be featuring street food snacks. Here’s our recommendations of tasty and affordable quick grubs that you could pick up and eat on the go. Commonly found in China and nearby Southeast Asian countries, fish balls are similar to the western meatballs. The meat is usually from pollock. Fish balls are usually sold by street vendors pushing wooden carts with deep frying woks in them. The flat looking meat balls are fried then skewered. Most often eaten with the vendor’s variety of dipping sauces. Tokneneng on the left. Kwek-kwek on the right. Kwek-kwek and Tokneneng are a tempura-like Filipino street food made from deep-fried, orange battered hard-boiled eggs. The main difference between the two depends on the egg that is used. Kwek kwek is traditionally made with quail eggs, while Tokneneng is made with chicken eggs. They are usually eaten with a sweet and sour dip made by the vendor. Iskrambol, similar to Halo-halo, is made up of shaved ice which is mixed thoroughly like a smoothie but more coarse. It is usually made with evaporated milk, banana extract, and sugar. Some add food color to make it more prettier. Vendors usually give you more autonomy with what ingredients to add. It’s like the cheap version of froyos. Everyone’s favorite toppings include powdered milk, chocolate syrup, strawberry syrup, mini marshmallows, candy sprinkles, and rice crispies. If ice cream trucks come with a jingle to let you know they are coming your way, taho vendors usually make their presence known with a resounding sing-songy yodel of “tahooooo”. The vendors usually walk around with two aluminum barrels hanging on a carrying pole on their shoulder. The taho peddlers habitually sells early in the morning in a route. 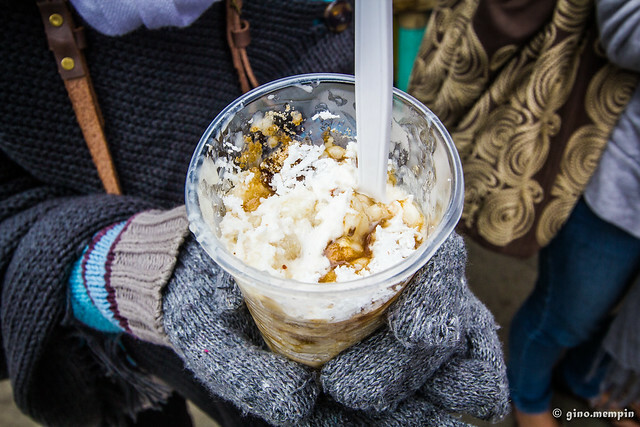 Taho is a snack made up of soft tofu sweetened with sugary syrup and topped with tapioca pearls. It is usually served in a plastic cup or you can provide your own cup. You can eat taho with a spoon or even a straw. It is best served warm or room temperature. Variations of this snack can be served with strawberry syrup (found in Baguio City) or chocolate syrup. It is similar to the Chinese snack doufuhua or beancurd jelly. You are probably familiar with egg rolls or spring rolls from your Asian restaurant menu. Turon is similar to that. You might as well call it sweet banana spring roll. This is one of my favorite go-to snack back home. So, instead of bean sprouts or ground meat, turon is filled with slices of banana (some sort of a Philippine plantain variety called saba) and sometimes, jackfruit wrapped in the lumpia wrapper. It is then rolled in brown sugar and deep fried into crunchy sweet awesomeness. This is usually sold next to the turons. The bananas are coated in brown sugar, skewered, and then deep fried. Making it a very tasty crisp caramelized treat. A usual serving will have 2-3 bananas per stick. Kamote-Q uses kamote or sweet potatoes instead of the bananas. Another personal favorite is green mango served with sauteed shrimp paste. Vendors will either slice for you an entire mango and give you a packet of the shrimp paste. Or if you want a quick bite of it, they also have half a mango skewered and topped with the salty paste spread. The mangoes are usually sour and crisp. Making the mix of flavors and texture with the salty shrimp paste a winner. You can try it at home. Buy some green mangoes from your favorite local market and either get some shrimp paste from the Asian store or the Amazon link below. Mamang Sorbetero or Ice Cream Man. Putting aside its nickname, the Philippine street food ice cream is a hugely popular snack. Pushed around on carts by the vendors known as sorbetero (ice cream man). These sorbeteros commonly carry around 3 flavors in their carts with cheese as the best seller. Some flavors that are available include chocolate, ube (purple yam), mango, and vanilla. You can eat sorbetes in a cup, a cone or, wait for it…in a bread bun! Yes, you can have ice cream sandwiches in the Philippines. Literally means “mix-mix”, this is one of the more popular Filipino desserts in the culinary world. Halo-halo is a blend of shaved ice, evaporated milk, fruits, sweet beans, jellies, and so on. Sweet, cold, colorful, and a myriad of different textures and flavors, no wonder this is everyone’s favorite especially on a typical hot and sunny day in the Philippines. One of the most famous, if not the most famous, street food from the country is balut. Thanks to bizarre adventure and food travel shows of Andrew Zimmern and Anthony Bourdain. Balut is a ready-to-eat partially developed duck embryo. Vendors carry a basket around their arms and yell “Baloooottt!”. It’s not for everyone. Growing up, I did not develop any liking for this treat but my friends and my family love it. Eating balut usually involves cracking a hole in the shell and drinking the “soup” inside. Afterwhich, you peel the rest of the shell, season it with salt and vinegar and eat the rest of the embryo and yolk. Unlike most of the sweet snacks in this list, binatog has a salty flavor to it. Binatog is made up of dried mature corn kernels. The kernels are soaked in brine until they puff up. They are then washed and boiled until very soft. It is served into a bowl and topped with grated coconut, butter, and salt or sugar to taste. How exciting! Let me know which one you like best.